Stress Free Holiday Tips to add more peace, love and joy to your holiday season! Sound good? How do you do it? Wow, can you believe it!? It’s the holiday season again. So it’s either panic, stress and chaos for you. Or is it the time for love, peace and joy? After all, it is a choice. I will share some tips to assist you to have a stress free holiday filled with peace, love and joy! Yes, you read that right. It’s a matter of remembering to take some deep breaths, or at least, once in a while. Deep breathing is nature’s natural tranquilizer. So if you feel rushed or stressed, take three deeps breaths. Breathe in slowly through your nose for the count of 5 to the point where your lungs are fully expanded. Hold it for 3 seconds. Then release the breath slowly through your mouth for the count of 8. This can be done anywhere at any time. Try it while you are stuck in traffic going to the mall, on line at the grocery store or even when looking at your credit card statement from all your holiday purchases. Deep breathing works wonders and it’s free! Always remember this: people will not remember the ‘things’ that you gave them for the holidays. However, they will always remember the experiences. How do you want to be remembered? 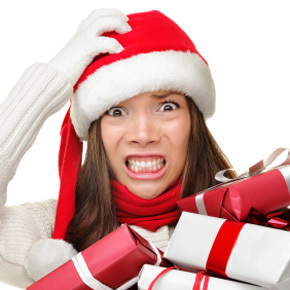 Do you want to be remembered for giving the perfect gift, holiday dinner or holiday card even if it meant you are stressed, agitated and overloaded? Or do you want people to remember you for how joyful you made the holidays, or even how joyful you were. Think about that for a minute. What type of holiday legacy traditions do you want to leave? Busyness or peace, love and joy? My neighbor remembers Christmas as being a stressful time of year for her parents. She told me a story about how angry and stressed-out her father was one Christmas and he threw the Christmas tree out the living room window (through the glass). When she recalls the story, it’s as if she was a little girl again. However, my neighbor is 80 years old! For her, she never had a stress free holiday. You can change that for yourself! Over the decades, the holiday season has become a time for material things. It’s a big money making time of year. After all, Black Friday now determines the future of our economy. If you don’t believe this is so, recall the news story a few short years ago when a man was trampled to death at a Long island, NY department store when the doors opened early the morning on Black Friday. Two store employees were also critically wounded when they tried to help the man. All in the name of a deeply discounted flat screen TV! I’m not suggesting that we have to be ‘anti-establishment’ or not support the economy. However, I am suggesting that it would be a lot less stressful and less expensive if you kept it simple. For example, a three foot table top Christmas tree can be just as fun for the family to decorate than the twelve foot monster. Remember, it’s all about the experiences! Another example is to purchase gift cards and/or give cash. I know, I know, gift cards have become an outdated way to give a gift, but if done properly, it can be the perfect gift. Cash always makes a great gift too and it’s the only gift I know that isn’t returned or exchanged after the holidays! When giving a Gift Card, make sure it’s from a place that the person loves to shop. Gift Cards now come in beautiful gift boxes that can be wrapped as a special gift. When you give cash as a gift, make a special presentation of it. For example, if you want to give someone fifty dollars, you can get ten, ten dollar bills. Rolls the bills in a tube shape with a small thin ribbon around each one (similar to a diploma). Then place the rolls of cash in a gift box similar to a box used for jewelry lined in cotton. These simple gift ideas are ways for you to still provide a nice, useful and thoughtful holiday gift without all the stress of running around to department stores or waiting on long lines. As far as keeping holiday gatherings and dinners simple, here are a couple of tips (especially if time is limited). Cater! Yes, cater! It doesn’t have to be expensive. Many grocery stores now provide fully cooked ham or turkey dinners along with all the side dishes and fixings, and they are reasonably priced. All you have to do it heat it up and serve. Or another idea is to have a ‘pot luck’ or ‘covered dish’ gathering. When given the opportunity, people love to ‘give’ and help out. Guests love to contribute. You provide the place and set the tone for the setting and your guests bring the food. Try it and you’ll never stress-out over a holiday dinner again. When sending holiday cards, purchase pre-printed cards with your name already printed in the card. All you have to do is write their name inside at the top of the card. Use pre-printed address labels and return address labels. With this approach, you can get 100 cards out in 20 minutes! Again, it’s a matter of giving up the perfection and keeping it simple. What does that mean? During the holidays, we all tend to be around more people than usual. It seems like all the ‘button pushers’ in your life show up all at the same time! Hint hint, you’ll want to manage your expectations of these people and for gosh sakes, make sure you’re not spending time alone with them! Grumpy Uncle Harry that you only see once a year. Or your daughters’ slug of a boyfriend. Remember, you can’t change people and it’s not your place to change them. Let them be and the holidays will be over before you know it. One of the most effective ways to make the personality conflicts dissolve during the holiday gatherings is to ‘give up your right to be right’. By that I mean, don’t engage in arguments. Just say ‘Uncle Harry, you’re absolutely right about that. Thanks for pointing that out to me. I never thought of it that way before.’ Trust me, Uncle Harry won’t know what to do with this and it will diffuse an argument before it even gets started. This then may be the first time an unruly, opinionated relative didn’t have anything to say! When in doubt, always remember this: the ones that are the most difficult to love, are the ones that need it the most! Especially during the holidays, adults can seem to act like needy children striving for your love and attention in any way they can get it. Love them anyway! Once you get this, you will have a stress free holiday! Take Time for Yourself to Decompress! The holidays are a time for family, friends and joy. Remember to add a little joy to YOUR day. Attempt to keep your regular schedule of eating and sleeping as much as possible. Don’t try to get it all done (whatever ‘it’ is.) Understand too that it is okay to say ‘no’. You don’t have to attend every event and do everything. And when needed, ask for help! Now that the tree is up, the cards are sent, the gifts are wrapped, take time for yourself. Enjoy the experience. Create some balance by giving yourself permission to relax and unwind. Put on your favorite holiday music, make a cup of tea and sit by the tree and enjoy. You deserve it. You now have five practical tips to make the holidays more peaceful and less stressful, are you going to use them? That’s up to you and it depends on what type of holiday season you want to have? One of perfection and stress or one of peace, love and joy! Enjoy your holidays and create lasting peaceful memories for yourself and those you love. Written by Chris Pattay. Chris along with his business partner Jon Satin are The Possibility Coaches. For over a decade they have been assisting individuals and business owners worldwide to live a life of meaning, passion and purpose. Previous PostChange Your Story to Change Your Life!Next PostJump from the Fiscal Cliff into the Spiritual Pool Now! Thanks for the informative and helpful ideas, I like them. Jaden, thanks for your positive feedback and have a happy holiday too!